In today's world, you would be hard pressed to find someone who has never heard of osteochondrosis of the spine. This insidious disease affects around 85% of the world's population. It’s important that all segments of society understand why osteochondrosis is dangerous, especially those involved in sedentary work. An individual suffering from osteochondrosis experiences frequent back pain and headaches, coldness and numbness in the limbs, fatigues easily, and has reduced mobility of the spine. The causes for the osteochondrosis are not fully understood. Most often, symptoms are first experienced at age 35 and older. This disease can develop and worsen out of all sorts of back injuries, a too sedentary, or conversely, too active way of life. With age, the symptoms appear more frequently. Nowadays, it is more and more frequent that people aged 18 to 30 notice signs of osteochondrosis. According to many experts who have researched this disease, the main cause behind the appearance of osteochondrosis is incorrectly distributed weight on the vertebral column. The resulting excessive physical pressure changes the structure of the cartilaginous tissues. 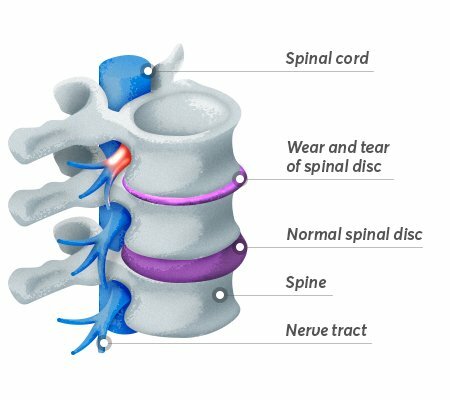 Spinal stenosis, which leads to disability. The treatment of osteochondrosis, as with any other disease, begins with a diagnosis from a doctor. During this process, the doctor (neuropathologist, orthopedist or vertebrologist) undertakes a set of necessary procedures: laboratory and x-ray check-up. Following the full set of diagnostic measures, the doctor can make an accurate diagnosis and prescribe the most effective treatment plan. Curative mud and mineral waters have a beneficial effect on the spine, but the most effective and accessible option is massage. If you have no contraindications to massage (no tumors, benign or malignant), regular massage highly is recommended. Including the Pranamat ECO acupressure massage mat in your routine will fulfill your daily massage needs and activate several physiological processes that can help treat symptoms of osteochondrosis. improve blood circulation, as well as a venous and lymphatic outflow from the affected area. Improved outflow will help reduce swelling in the vertebral issues. Meanwhile, the inflow of arterial blood rich in nutrients and oxygen will speed up the elimination of damage and aid regeneration. get rid of muscle spasms. Increased muscle tension causes not only difficulty moving, but also a pain syndrome. Acupressure massage has a positive effect on the muscular system, regular massage relieves pain and removes stiffness. produce a calming effect on the central nervous system. Emotional stress plays a significant role in aggravating osteochondrosis. Therefore, massage, in this case, can offset the need for pharmaceuticals, such as antidepressants.